Happy Halloween! Yesterday was fun, but full, after taking baby to two different costume parties. We were lazy this morning and the house was chilly, so I offered to make my version of french toast, which is actually baked and sort of a cross between french toast and bread pudding. I like it because you let the oven do the work without needing to stand at the stove to flip. As I beat the fresh eggs, I got out the spices. We were out of cinnamon so I pulled out a bottle of Pumpkin Pie Spices. That got me craving the seasonal favorite, so I added a cup of pumpkin to the custard. This pumpkin bread pudding is not to be confused with a bread pudding made with pumpkin bread, similar to this Zucchini Bread Pudding, although that would be yum if you happened to have extra pumpkin bread lying around. In this case the pumpkin is added to the batter making it like the custard filling for a Pumpkin Pie. Preheat oven to 350° F. Place the butter or coconut oil in an oven safe baking dish and put it in the oven while it is heating up, just until the butter/oil has melted. Take it out and swish the pan to completely to cover the bottom with grease. Slice the day old bread. If it isn’t dry enough, toast it briefly. 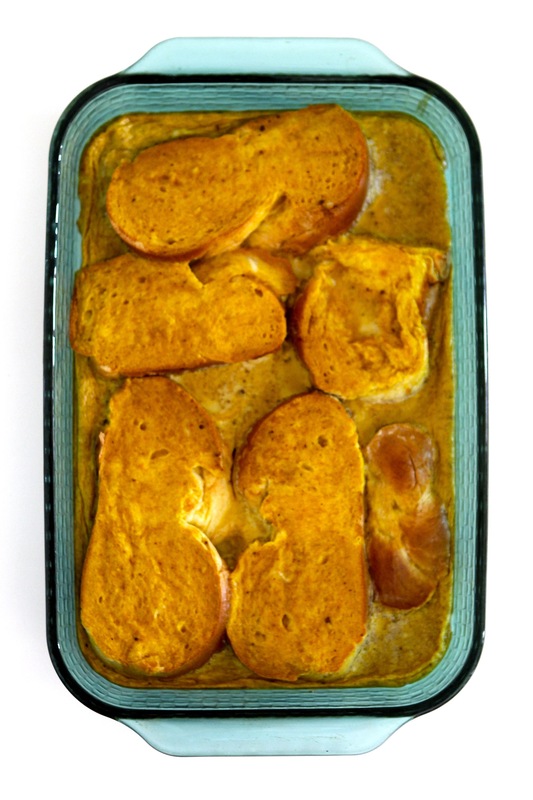 Line the pan with the bread slices and poke them several times with a fork. In a mixing bowl, beat the eggs and then mix in the rest of the ingredients. Pour over the bread in the dish. Bake until the custard is set, approximately 30 minutes. I find it is usually done when the kitchen starts smelling delicious. Serve warm with maple or cajeta syrup. Our baby loves this and seemed to like it even more with the pumpkin. 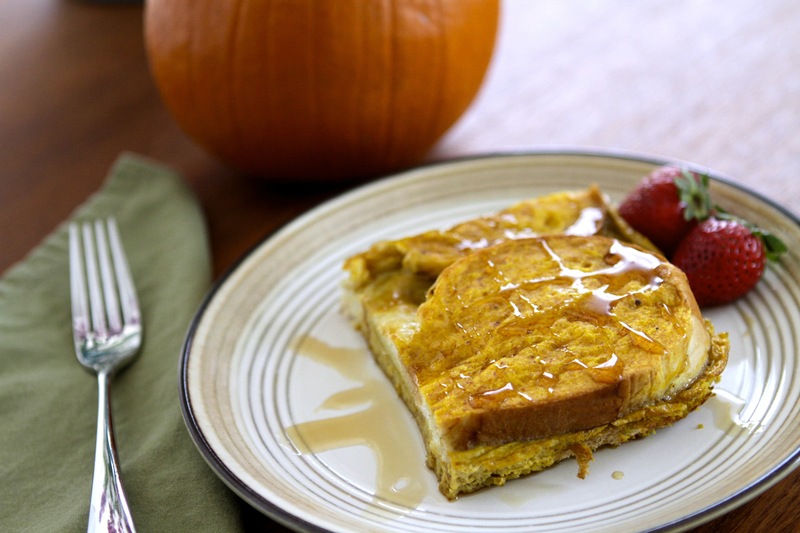 For a truly decadent french toast and morning, soak the bread in the batter the night before. Whenever I have extra bread, whether challah or baguette, I pre-slice it and freeze it, wrapped twice in plastic. I very briefly microwave it to defrost, covered in a damp paper towel.